Brief Synopsis – In October 1993, Elite US Soldiers stationed in Somalia went on an easy mission that turned deadly. My Take on it – As a former Infantry soldier, nothing scared me more than to be in a an active firefight. Thankfully, I never was in one, but after seeing Black Hawk Down, I understood the fear even more than before. Every soldier under fire deal with the following uncertainties during the fire fight; the chaos of not knowing where the next bullet or rocket will come from; how to deal with injured or dead platoon mates and the most important and troubling question of all; will I get out of here alive. This movie embodies those dilemmas by showing us what happened in Somalia in 1993. Looking back, there were many errors made by many involved which caused the high casualty rate, but the fact that the soldiers on the ground tried to keep their heads on straight helped many of them get out alive. 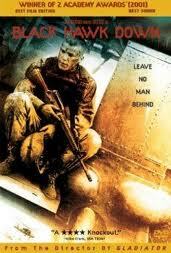 Saving Private Ryan (1998) is still the scariest war movie ever made, but this movie comes in a close second. Perhaps the fact that this movie depicts recent warfare instead of WWII makes it that much more scarier. Both of these movies will forever be etched into my mind as the most realistic depictions of warfare in a movie. Ridley Scott directed this movie based on the articles written by Michael Bowen and the only flaw I see in this movie is the fact that there are so many characters that it is sometimes very difficult to differentiate them one from another. The chaos of the fighting doesn’t help the situation. Even though the movie does a moderate job of introducing us to some of the main characters at the beginning of the movie, the fast-paced action makes all the soldiers in full army gear difficult to recognize (and empathize more with) each character. Bottom Line – If you want to try and understand better what an infantry soldier goes through during close-quartered fighting, this is the best example (so far) on film. Highly Recommended!